Titillated by rum punches and in dire need of a break, I was drawn to the Caribbean for my winter vacation. With a little quirky planning and some high-season luck, I found myself relaxing in Jamaica without a care. And the cost was “no problem.” Ya, mon! I knew I wanted to go to the Caribbean, but didn’t necessarily care which island. I was also aware that it was high season, and I’d be competing for availability and great prices. My goal was to spend no more than $150 per night on a room, and no more than $350 on airfare (before taxes). 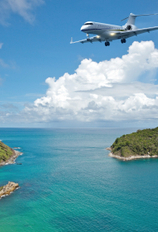 My backups were the Pink Fancy Hotel in St. Croix, Chez Martine in St. Martin, and Yamseed Inn in Nevis. When I checked Dream Maps, three Caribbean options came up within my price criteria: Nassau, The Bahamas; Montego Bay, Jamaica; and San Juan, PR. Bingo! As Montego Bay was the main airport that services Negril, I had a match, and my first choice at that. The base price was $320 round-trip per person. Several airlines offered the fare, including US Airways, my preferred carrier as I hoped to maximize my miles. I wound up picking a slightly higher fare to perfectly coincide with my hotel dates and pamper my vanity for nonstop flights. Still, the total cost came to only $401 round-trip including taxes. I then checked if there were any applicable bonus mile offers. Sure enough, I would get 2,500 miles in addition to flight miles. Plus, I booked both transactions on my Dividend Miles Visa, which would earn me 1,500 additional miles at one mile per dollar spent. Luckily, I decided not to rent a car because it was easier, and cheaper, to get around without one. For those who literally want to just “stay” at their hotel, most resorts provide food and services all day. However, for those wanting to explore, the nicer restaurants provide complimentary shuttle service with hotel pickup and drop-off. You only pay the driver’s tip. Transfers to the hotel from the airport, a little over an hour drive by minibus, cost around $60 each way for up to four people. (The driver quoted me an inflated $70, but I haggled him back down to $60). To bring the cost down even more, we rode with other hotel guests on the way back. Hotels will also arrange excursions with transportation—I went on a horseback ride through a rainforest and in the sea for $60, which included the drive to and from the stables. 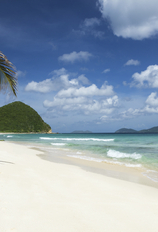 You can also take a glass-bottom boat ride to the famous Seven Mile Beach for a nominal fee. To get anywhere else, you have to take a taxi. Check with your hotel for average prices, and make sure that your cab has a red license plate, to ensure you’ll get a legitimate ride. The Rockhouse, like many resorts, can be a destination in itself. Among tropical gardens and secluded nooks, I experienced guilt-free indulgence, with all the luxury and none of the price tag. The rooms were fashioned with ceiling fans and four-poster beds draped with mosquito netting; while private, outdoor showers were stocked with native coconut and molasses soaps. Services included hour-long massages for $60 and yoga by the sea for $15. 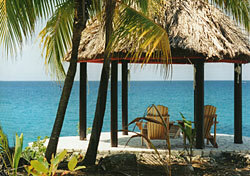 With Negril being Jamaica’s more laid-back resort area, food in general is casual and reasonably priced. Entrees at the best-rated restaurant, Norma’s at Sea Splash, average around $18. Every other restaurant costs less, including the local family dive Sweet Spice, where you can get a complete chicken dinner for under $6. Other places of note were Kuyaba (practically on the sand next to Bourbon Beach, where I caught a live reggae show for $3), The Hungry Lion, and of course, the Rockhouse, with arguably the best food in Negril. I also recommend hitting the roadside for authentic—and cheap—jerk chicken, or the seaside joints like Pirate’s Cave, where you can watch cliff divers for free while you eat. Shopping in Jamaica is trying, and bargaining is the name of the game. It is very difficult to walk past a vendor without getting haggled. At the craft market near the beach, I became a local celebrity when sellers learned I was looking for coffee. I bargained and got a pound or two of the world-famous Blue Mountain roast for $10. As a general rule of thumb, offer to pay half of the stated price. The sellers expect it, and most often will agree on a price within seconds. Also learn to get comfortable saying “no thank you.” Otherwise, you’re likely to become a scarecrow of stringed beads and shells, hanging baskets, and straw hats. Shops in town or at resorts have fixed prices, but I found that asking “can you give me a good price on this?” with a smile can award a break. Nevertheless, my favorite store, the Hi-Lo grocery store in Negril town, is the best place for hassle-free, nontourist prices on rum, coffee, and spices.